An income statement is a financial document that shows the income and the expenses of a company for a specified period of time. It shows how the revenues turn into net income. Its purpose it to show the shareholders and potential investors, if the company made money or not during the reporting period. 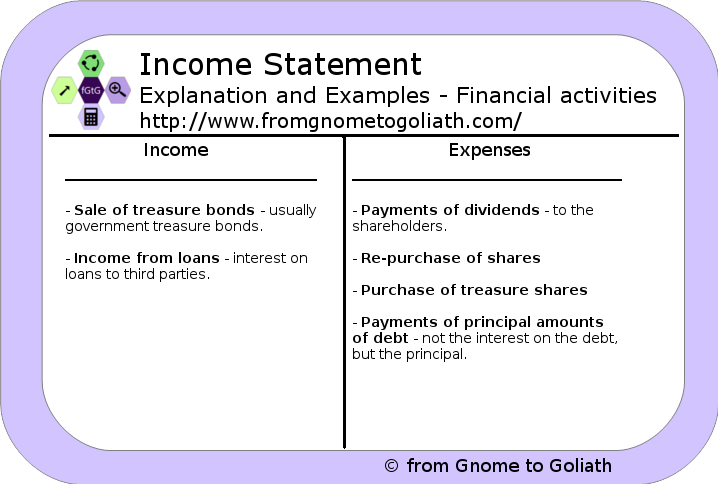 The difference between the income statement and the balance sheet is in the time period. The balance sheet represent the current state of the company in a single moment in time. 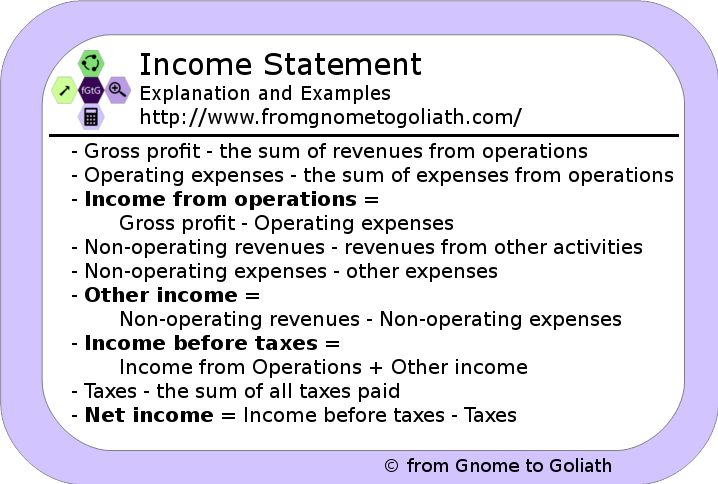 And the income statement represents a period in time (much like the cash flow statement). The first method is the simpler one. First of all, the accountants sum all revenues. Then, they sum all expenses. And finally, they subtract the expenses from the revenues. This method is more suitable for small companies. The other method is more complex and it includes several steps to calculate the bottom line. First of all, the accountants calculate the difference between the income and the expenses from the daily business of the company. Then, they calculate the difference between the other income and expenses. And finally, they calculate the tax and subtract it from the income before taxes. 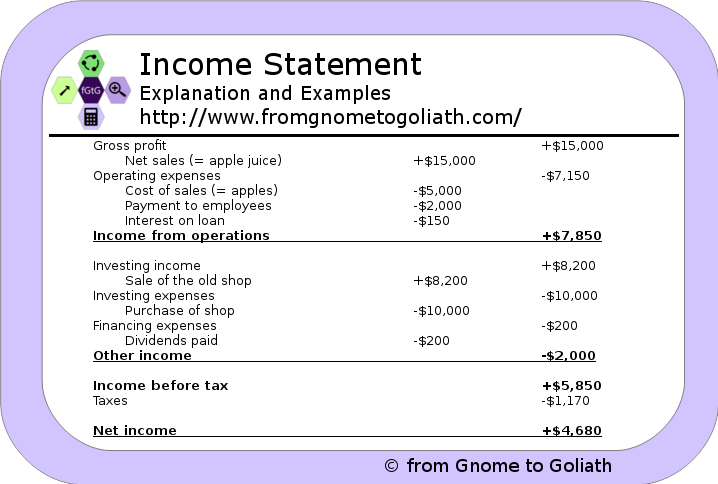 Lists the main parts of an income statement. The second method is, obviously, used by the larger corporations. The different parts of the income statements (Multi-step method) are divided into several categories: operating activities, investing activities, financing activities, irregular items, management commentary. These are the income and expenses from the actual operating activities of the company. For example, if our main activity is turning apples into juice, then selling those juices and the expenses for the apples fall into this category. Lists the most important examples of income and expenses from operating activities. These are all non-operating, investment activities that are long term. For example investing in new equipment, machines – everything that has to do with the operating activities but that is long-term. Also, granting and getting back loans from others fall into this category. 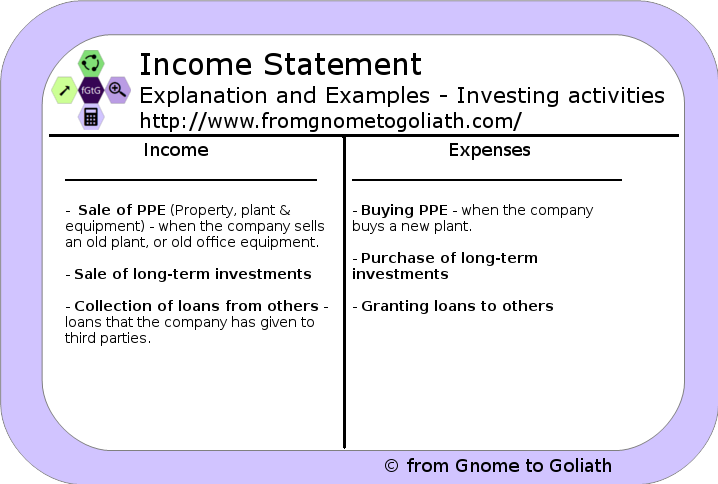 Lists the most important examples of income and expenses from investing activities. Here fall all non-operating, financial activities, for example the income from loans to third parties or payments of dividends to the shareholders. Also, paying and receiving long-term debt. Lists the most important examples of income and expenses from financial activities. These are all items that are irregular, which means that they should not occur in next periods. This section helps investors to better predict future incomes and expenses. Most commonly, the cost of discontinued operations comes here. It is not very often, that companies have to shut down parts of their operations. This final section is the chance of the management (usually the CEO) to provide narrative information about the company, its performance and its future. Development and position of the business – where the company stays now and where it is going. Key performance indicators (both financial and non-financial) – indexes calculated based on the income statement or balance sheet. Or other business-specific indicators. Events of importance – opening new factories, closing old ones. Principle risks and uncertainties – competitors’ moves, government regulations. R&D activities – new products, enhancements of old products. In our example of income statement out company has sold $15,000 worth of apple juice. And it has paid $5,000 for the apples and $2,000 to the employees. Finally, the interest on the long-term loan was $150. The company bought a new shop for $10,000 and sold the old one for $8,200. Also, it paid $200 in dividends. The income before tax of the company (also called EBIT or earnings before income tax) is $5,850. We assume a 20% flat tax and when we deduct that, we get the final net income of the company. Understanding the different accounting documents is very important for an entrepreneur. Reading the financial statements of other companies (which you would like to acquire or partner with) is more important and common than doing your own statements. But even though you would usually have an accountant dealing with that, you will still have to proof read them and accept or reject them. As a further reading material, I would recommend learning about the different indexes calculated based on the income statement. They usually show how viable a company is and can help gain valuable information about it.